AS THE FLATLANDERS DROVE TO NASHVILLE in March 1971 to cut their lone album, Tammy Wynette was sitting atop the country charts with "Bedtime Story". Both the Flatlanders and Tammy fell under the generic heading of "Country Music." However the music that the Flatlanders cut that month could have come from a different planet than that emanating from every other pore of Music City. The link between the acoustic joys of the group and the then-current Nashville mainstream was tenuous at best. Surprisingly, it is the Flatlanders' music that has better weathered the years. It sported none of the lyrical contrivance or woeful over-production of much that passed for country music at the time it was recorded. However, recording at a point when it seemed as though country music and middle-of-the-road pop might merge into a bland hybrid, the Flatlanders were doomed. As their name suggests, the group was formed under the huge empty sky above the west Texas plains. "I knew Joe Ely and Butch Hancock separately from much younger years," recalled lead singer Jimmie Dale Gilmore. "In fact Butch and I had been friends since we were 12 years old. Joe and I had been friends since I was 19 or 20 and he was maybe 17 or 18. We were both born in Amarillo and we recently discovered that his father met his mother and my father met my mother at the same high school. Is that not weird?" Gilmore first recorded during the mid '60s for Buddy Holly's father through a chance encounter between a British journalist on a pilgrimage to Lubbock and Gilmore's girlfriend. Mr. Holley took a shine to Gilmore's music and recorded a set of demos that he hawked to Norman Petty and others with no success at all. "It so happened that in 1970 we all happened to be back in Lubbock," recalled Gilmore. "I had been in Austin working with a band called the Hub City Movers. Joe had been traveling in Europe and Butch had been in San Francisco. We just coincidentally moved back to Lubbock at the same time and started playing together. There was no design to put a band together as such but the chemistry was so great that it just took on a life of its own. We all had a common love of folk music, country and country blues-but then we also loved the Beatles. We had very eclectic taste. There was great radio in Lubbock at that time especially the border stations at night. We listened to it all." Gilmore, Ely and Hancock roomed together on 14th St. in Lubbock. Other musicians drifted in and out of the group including Steve Wesson who learned the musical saw and autoharp specifically so that he could play with the band, Tommy Hancock (unrelated to Butch, incidentally) who played fiddle and ran a bar, Sylvester Rice and Tony Pearson. It was this line-up that found itself in Nashville in March 1972, although Jesse Taylor (who later played in the Joe Ely band) and others could stake a claim to be called 'Flatlanders'. The sessions for Shelby Singleton were the result of a meeting between Royce Clark, a freelance producer who worked for Singleton, and Gilmore's manager Lou Driver Clark, who also worked as an actor under the name Clark Bentley (and can be seen playing a dee-jay in "Coal Miner's Daughter") came back to Lubbock for Christmas in 1971 and was introduced to the band. He liked their unusual sound and made a demo tape in Odessa that he took back to Nashville. Clark convinced Singleton to bring the band in for some sessions. They arrived in March 1972. The Flatlanders sound was akin to a pre-War 78 rpm without the crackle and hiss-except that the lyrics were stunningly contemporary. It was a compelling juxtaposition of the old and new, as if Riley Puckett had finished a degree in modern poetry and spent a month in the desert with some funny cigarettes. Jimmie Dale Gilmore had written one of the most compelling songs on the album, Dallas. "The hook line of the song occurred to me while I was actually flying into Dallas," he recalled "The line just presented itself to me. I had all those mixed feelings about the city and the song just came gradually. I've never felt that I've got it down right though. I've always been a perfectionist about that song. Joe also recorded it several times before he got the version that they put on the Musta Notta Gotta Lotta album. I've had a strange relationship with the song. I've had periods when I wish I'd never written it, then I've rediscovered it, looking at it through different eyes." Butch Hancock also contributed one of his strongest compositions, "You've Never Seen Me Cry'. "It expressed all the feelings I had about listening to the radio late at night," said Gilmore. Almost every line conjured up a vivid image without a wasted word or obscure meaning. After the sessions, the group was taken out for a photo shoot that did not go as well as had been hoped. After several abortive experiments, they were taken to the Country Music Hall of Fame and placed in front of the Jimmie Rodgers plaque. "Then the guy's camera broke," recalled Gilmore. "Butch leaned over to me and said, Man, Jimmie Rodgers does not want this to happen'." The group went back to Texas awaiting the album and perhaps the acclaim that would follow. By the end of April, Singleton had released a double sided promo single of Dallas and had an album mastered, designed and ready to roll but the lack of response to Dallas presumably persuaded him to abandon the endeavor. The album was scheduled again later and was actually manufactured in the 8-track configuration only. "After the album we did a few gigs," recalled Gilmore. "We wandered off to south Texas and by accident played at the first Kerrville festival A friend of someone in the band was displaying some artwork down there and we were just invited to perform. We played a few more gigs and then Tony and Steve just dropped out. Tommy Hancock and his family moved to New Mexico into a cabin. Joe and Butch and I all went up there for a while. Tommy and I ended up moving to Denver. I had been a student of Vedanta philosophy and other oriental philosophy for a long time. Then I studied under the guru Maharaji and moved to Denver for a while, playing music only as a hobby." Joe Ely started rambling, ending up serenading subway passengers in New York. He returned from there to Lubbock in 1974 and formed a band with some local musicians including Jesse Taylor and Lloyd Maines. By 1975 he had built a huge following in Lubbock and was signed by MCA Records to their Nashville division. The music that Ely cut in Nashville bore almost as little relation to the country mainstream as his work with the Flatlanders five years earlier. By 1980 though, Ely had been unexpectedly embraced by the Clash and his music was losing the acoustic character that remained from his days with the Flatlanders. Butch Hancock moved to Clarendon and worked on the design of an amphitheater, reverting back to his first trade, architecture. He recorded some underground albums for his own Rainlight label. The album titles alone evoked a mood similar to the one he helped to capture on the Flatlanders' album: "West Texas Waltzes and Dust Blown Tractor Tunes" and "The Winds Dominion". Jimmie Dale Gilmore saw a little reflected glory from the fact that Joe Ely used some of his songs and in 1980 he returned to Texas, settling in Austin. After a long hiatus from recording, he cut a stellar album for the Hightone label in 1988, Fair and Square, which showed that his delightfully anachronistic vocals could be successfully married to a contemporary backing. 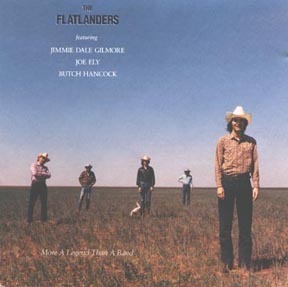 The Flatlanders regrouped for a reunion at the Kerrville Festival several years ago and have garnered a surprisingly strong posthumous reputation for a band that had no records (other than a promo single) released during its lifetime and barely played outside its hometown. Reflecting on the album, Joe Ely said, "It's pretty crude but there's a certain flavor about the record. It had an eerie, lonesome sound which reflected our roots in Lubbock and the wind, the dust and the environment." Jimmie Dale Gilmore said, "There was something magic about that band. It probably has a higher reputation now than it ever did. Every time Butch and Joe and I go out on the road, people want to know about the Flatlanders. They have bootleg cassettes and so on. We always say it was more a legend than a band." In the last few years, country music has come to a belated appreciation of its roots which makes this an appropriate moment to reassess the Flatlanders. The group was arguably fifty years behind its time and fifteen years ahead. Today, with a savvy producer and a trip through the promotional vortex, they might have made it. In 1971 they did not stand a prayer. home Interviews Stories Pictures Lyrics What's New?